REVOX has put together a team comprising engineers, chemists, microbiologists, project managers, business consultants, and quality and regulatory professionals that are subject matter experts with strong expertise and experience in their fields. 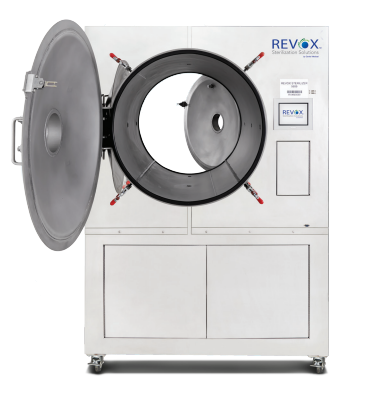 REVOX can work to enable sterilization technology to work to its fullest potential for medical devices. The company offers rapid 30-day sterilization development, materials and microbiological laboratory testing, supply chain optimization services, and regulatory development expertise. The overkill method is most commonly used for gas- or vapor-based sterilization. This method uses a biological indicator(s) populated with 106 (1 million) of the most resistant organism (MRO). A fractional (time), or sub-lethal cycle(s) is run to determine the D-Value of the product in a given sterilization process. The D-Value represents the amount of time needed to kill one logarithm (log) of the MRO. The half cycle is determined by multiplying the D-Value determined in the fractional cycle by six, plus a safety factor. The calculated half cycle is then tested to verify that a six-log reduction is achieved in all locations within the load. A full cycle is double the time/injection of a half cycle. This results in a sterility assurance level (SAL) of 10-6 or a twelve-log reduction. SAL 10-6 represents a 1:1,000,000 possibility of a non-sterile device. The bioburden method is most commonly used in radiation validation, where the native (starting population) bioburden is used to determine the dose needed. This method requires quarterly (annual basis) monitoring of your device’s bioburden levels. 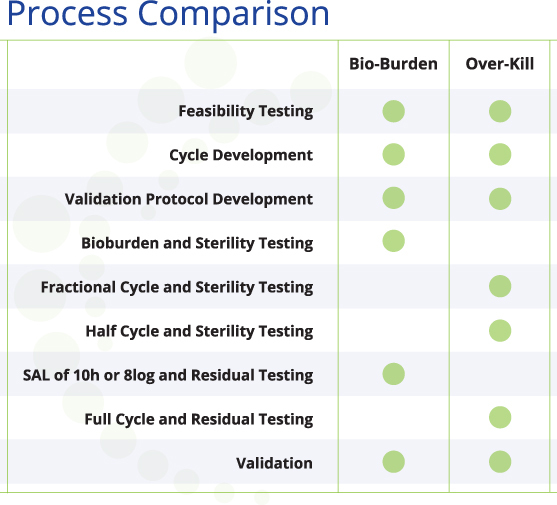 Using the bioburden method for gas- or vapor-based sterilization validation is slightly different than the method used for radiation. The native bioburden level is still measured, but used to determine the sterilization cycle, and the amount of most resistant organism (MRO) needed for testing. For example, if your device has two logs of native bioburden, a two-log biological indicator of the MRO is used. A cycle is developed to kill two logs of the MRO in the hardest-to-reach locations within a load. This cycle is then multiplied to achieve a SAL of 10-6, or an eight-log reduction. The bioburden method is typically used for devices that are too sensitive for the overkill method. REVOX’s sterilization solution has proven its sterility with at least one method in testing and validation, and therefore offers a better sterilization alternative for delicate materials. For an overview of materials that are compatible with the peracetic acid/hydrogen peroxide technology, download the Materials Compatibility Guide. For an example of the invaluable uses and benefits of REVOX’s technology and services, download the case study about OsteoSymbionics®. To learn more about how you can bring sterilization capabilities into your manufacturing facility please click here.